Vegan food is becoming a staple option at events and restaurants all over the world. New York City has generally been an area to offer vegetarian or vegan options over smaller cities, but veganism hasn’t always been considered such a standard lifestyle. Now, the Beyond Burger and the Impossible Burger are aggressively popping up on menus all over the country, but especially in my neighborhood of Astoria. It’s a pretty exciting time for us vegans! However, while breakfast, lunch, and dinner choices are flourishing, one vegan course is still limited in its expansion… where’s the sweet stuff? Greek and Italian bakeries are a happy walk away from me, but they don’t have any plant-based options and if they do, the staff isn’t educated about them to help customers with allergies and lifestyle restrictions. While the sweet treat festival that took place over the past 2 weekends in NYC wasn’t strictly vegan, there were plenty of vendors offering up dairy-free/egg-free/gelatin-free concoctions! I scoured the festival for the goods and if a vendor didn’t have anything vegan with them, I made sure to find out if they had options in their stores or on their websites. It turns out more than half of the vendors have at least one vegan option… woohoo! 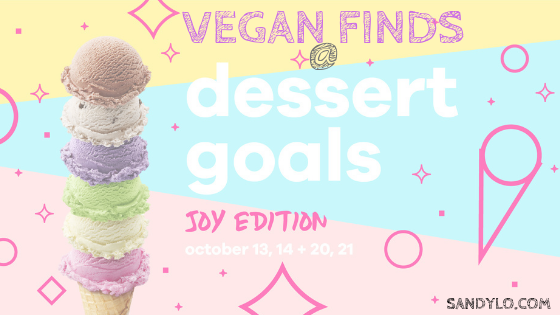 Before you scroll through my treasures, I want to thank Miraya at Dessert Goals for having me and the entire staff for clearly outlining vegan options and allergens on their festival map that helped me navigate around. This is the 5th Dessert Goals festival and it was a treat for the taste buds and eyes! 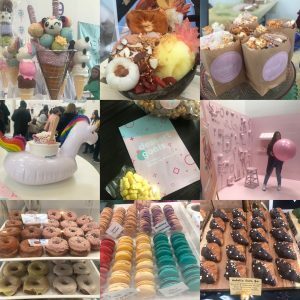 The theme was “Joy” — incorporating lots of pastels, unicorns, and sweet magic with photo-worthy Instagram setups and pretty treats. I’ve been following Smoothme on Instagram for a bit and I’m so glad I finally got to try their Unicorn Vanilla ice cream float! Don’t think root beer — this float was a literal unicorn blow-up floatie! Adorably presented with all of the toppings I could want – vegan marshmallows, coconut, and rainbow sprinkles! Yum. 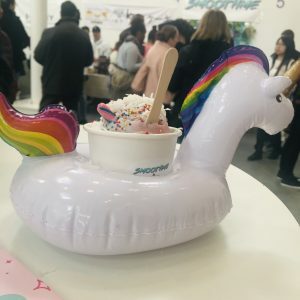 Smoothme is all-vegan and while they’re only available at events currently, I have a feeling this brand will be growing fast! The chef and owner, Diane Forley, serves up light meringue treats with just the right amount of sweetness and compassion, using aquafaba (chickpea brine) instead of eggwhites. 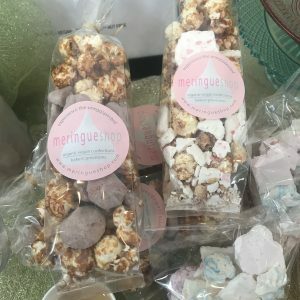 Her shop includes caramel popcorn, different flavored meringue, and baking decorations. 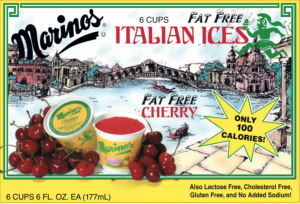 Marino’s Italian ices have been a New York staple since the ’60s. I grew up being able to get their ices from the ice cream truck and it’s a familiar comfort to see them at a festival full of plenty of hip new startups. One vendor that stood out as one of the most exotic and delicious offerings was Kochin, which sells Southeast Asian inspired desserts. 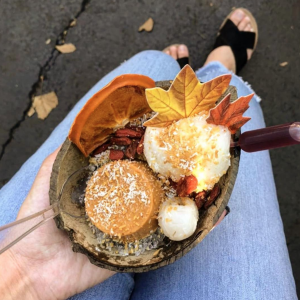 While not all of their treats are vegan, their Autumn Crush bowl is — and super cute to look at! Who doesn’t love pie? With Thanksgiving right around the corner, I’ll bet Petee’s will be busy with delivery and pick-up orders in the NYC area! 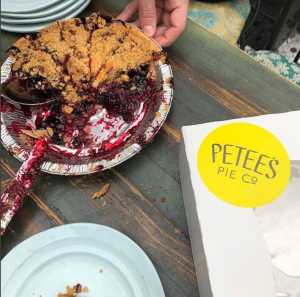 Currently, Petee’s offers 3 vegan pies: Apple Crumb, Cherry Crumb, and Blueberry Crumb. 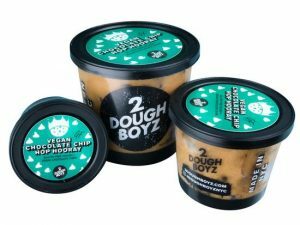 With a clever name and offering every sweet lover’s dream — edible cookie dough — 2 Dough Boyz hits the spot with their Vegan & Gluten-Free Chocolate Chip Hop Hooray! Serving as a sponsor of Dessert Goals and a vendor, Sugarfina offered free bags of yummy candy in cute shapes and colors. 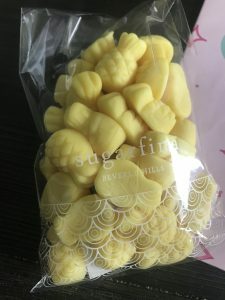 On hand, they had one vegan option – pineapple gummies! While I’m not a huge gummy candy fan — these tasty fruit gummies tasted like the real thing! Their website has plenty of more vegan options that would be perfect for a party or party favor. These beauties were on display. Unfortunately, I didn’t get to sample these cakes since they didn’t have their vegan choices with them. 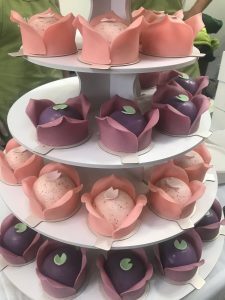 Located in Forest Hills, this Asian-American cake boutique does have vegan flavored cake on the menu. 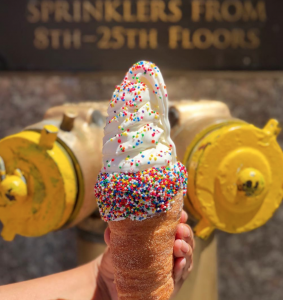 While it’s unclear which fillings in the Chimney Stacks are vegan, one thing is for sure… their cinnamon sugar dough cone is free of eggs and dairy. To find out when Dessert Goals is coming around again, make sure you follow them on Instagram: @omgdessertgoals. 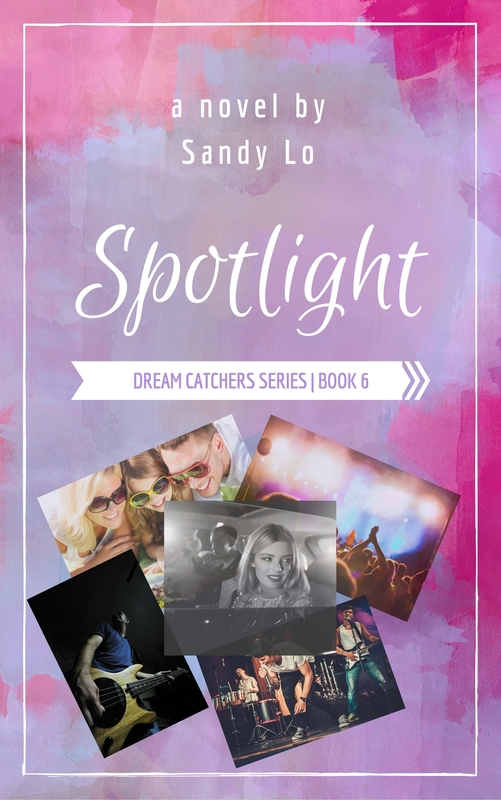 If you want to see more yummy goodies, follow me as well: @SandyLoMedia. I’ll be posting more photos from Dessert Goals all week long.